ATHENS, Ga. – Behind 701 yards of offense – just 12 yards shy of the school record – the fifth-ranked University of Georgia Bulldogs defeated the University of Massachusetts Minutemen 66-27 at Sanford Stadium on Saturday evening. Georgia starting sophomore quarterback Jake Fromm produced a 4-for-4 clip with 97 yards and a touchdown before freshman Justin Fields entered the contest to accumulate 100 yards on the ground and 121 through the air with three touchdowns. Five other members of the Bulldog backfield joined Fields on the ground with nearly 50-plus yards apiece and five combined touchdowns. Freshman tailback James Cook totaled 76 rushing yards and two touchdowns in the second half. In the first half, junior wide receiver Tyler Simmons guided the Bulldogs to 14 points with two trips to the end zone – one rushing, one receiving – which made him the first Bulldog to register one of each in the same contest since Mecole Hardman in the 2018 CFP National Championship Game. The Bulldog offense did not send freshman punter Jake Camarda to the field; all but two possessions resulted in points, due to a fumbled punt return and the end of regulation. Georgia played to the third down only six times. 66 points marked the most for Georgia (10-1) since its 70 against Northeast Louisiana in 1994. After the Bulldog defense forced a three-and-out to start the game, Georgia needed just three plays to run for 66 yards, fueled by a career-high 49-yard rushing touchdown from Simmons for the 7-0 lead, capped by a Rodrigo Blankenship extra point. A second consecutive Massachusetts (4-8) three-and-out sent the Bulldog offense back to the field for a 10-play, 68-yard march. Three-straight Fromm completions were paired with a rushing attack from sophomore D’Andre Swift and junior Elijah Holyfield, who sealed the two-touchdown margin with a 5-yard trip to the end zone. After a fair-catch squib from Georgia, Massachusetts acquired the ball on the Bulldogs’ 16-yard line. Four plays later, the Minutemen cut the Georgia margin to 14-7 with a 5-yard rushing touchdown. In response, Fields directed a 7-play, 80-yard scoring drive, featuring a 47-yard rush from the first-year Bulldog. Under pressure in the pocket at the 11-yard line, Fields found junior wide receiver Riley Ridley for the touchdown and the 21-7 advantage. After another Bulldog defensive stop, Georgia used two plays to reach the end zone for the 28-7 lead. Following a 2-yard Swift run, Fromm connected with Simmons through the air for a 71-yard touchdown. Massachusetts tacked on a 34-yard field goal with 7:19 remaining in the half, but Georgia reciprocated on the next drive. A 54-yard Isaac Nauta reception from Fields placed the Bulldogs at the 3-yard line, where Fields used an elusive dash to the end zone for the 35-10 score. Before the end of the half, Fields was presented another chance for point production: the freshman placed the ball in the hands of a sprinting Mecole Hardman downfield for the 57-yard touchdown. A second Massachusetts field goal secured a 42-13 score headed into intermission. Cook opened and closed the first Bulldog drive of the second half with a 34-yard kickoff return and a 26-yard rushing touchdown, the first of his career. A Blankenship PAT sealed the 52-13 score. After another Bulldog defensive stop, senior tailback Brian Herrien pushed his way into the end zone for a 6-yard touchdown to conclude a 9-play, 80 yard drive. Massachusetts senior wide receiver Andy Isabella added his first of two touchdowns in the second half, but Cook returned to the end zone in the fourth quarter, evading several Minutemen defenders to finalize a 6-play, 75-yard drive with a 27-yard touchdown. Isabella checked in with his second touchdown for the Minutemen on the night with 8:55 remaining, but the Bulldogs remained in possession to seal the final at 66-27. Up next, the Bulldogs’ regular season comes to a close at Sanford Stadium on Saturday against Georgia Tech. Senior day is slated for a noon start time on SEC Network. *A Whole Lot of Offense: The Bulldogs tallied the second most offense in school history with 701 yards (426-rushing, 275-passing) on 62 plays. The school record is 713 against Florida Atlantic in 2012. Georgia’s 66 points tonight was the most since 2014 when the Bulldogs blanked Troy 66-0 in Athens. With today’s 66-27 win, Georgia moves to 10-1 overall and the senior class improves to 41-11. Senior Day is next Saturday against Ga. Tech at Noon (SEC Network). *Freshman Justin Fields became the first Bulldog QB to have at least 100 yards rushing since Quincy Carter in 1999 against Kentucky. Carter had 11 carries for a team-best 107 yards plus went 16-for-28 for 304 yards passing with 2 TDs and 1 INT in a 49-34 win in Athens. *The last time a Bulldog QB was the leading rusher for the Bulldogs in a game was D.J. Shockley in 2005 against Boise State here, going for 85 yards on five carries with a TD in Georgia’s 48-13 win. *Quick Strikes: Georgia scored touchdowns on six of its seven possessions (3 plays, 66 yards in 0:57; 10-68 in 4:58; 7-80 in 2:57; 2-73 in 0:48; 3-72 in 1:00; 4-81 in 1:01) to build a 42-13 edge by halftime. The only drive that did not result in a touchdown came on a fumble on a punt return. Georgia had 431 yards of offense on 29 plays in the 1st half. Sophomore QB Jake Fromm went 4-for-4 for 97 yards and one TD in directing scoring drives on the first two and then fourth possessions. True freshman QB Justin Fields got the 3rd possession, which featured a career-long 47-yard rush by him, and he capped an 80-yard drive with an 11-yard TD pass to junior Riley Ridley. Fromm returned for the fourth possession, and connected on a 71-yard TD pass to junior Tyler Simmons for a 28-7 lead. Fields got the fifth possession and marched the Bulldogs 72 yards down the field for a TD in 60 seconds. The big play on this drive was a 54-yard reception to tight end junior Issac Nauta. Fields got the sixth possession and led another quick TD drive in 1:01 capped by a career-long 57-yard strike to junior Mecole Hardman to make it 42-7. Fields was 4-for-5 for a career-high 124 yards and 2 TDs in the first half. In week three, Georgia scored 42 points in the first half against Middle Tennessee en route to a 49-7 win. *Second Half Offense: The Bulldogs went 4-for-5 in scoring (3-TDs, 1-FG, then ran out the clock). Fromm started the second half and led the Bulldogs on a 4-play, 66-yard drive in 2:05 as freshman James Cook notched his first career TD on a 26-yard run. 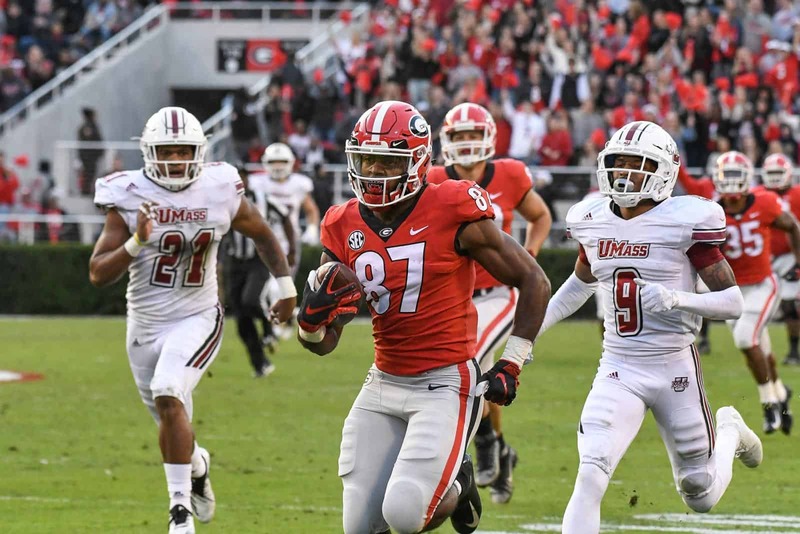 On the next possession, Fields returned and Georgia kicked a 40-yard field goal after going seven yards in four plays; On the 3rd possession of the 2nd half, Fields led the Bulldogs to another TD (9-80 in 5:24) including a 30-yard run to give him 100 yards on the day. Fields finished 5-for-8 for 121 yards and 2 TDs. Freshman QB Matthew Downing took over in the 4th and led a TD drive covering 75 yards in six plays in 4:10 to make it 66-20. *Scoring Defense: In the first half, Georgia held UMass to 13 points as the Minutemen ran 39 plays for 206 total yards. UMass won the toss and elected to take the football and then went three-and-out. UMass got its first touchdown after a Bulldog turnover, needing to go only 16 yards on four plays to cut it to 14-7 in the first quarter. In the second half, the Minutemen scored 14 points overall with a 75-yard TD from Ross Comis to Andy Isabella to cut it to 59-20 and a 45-yarder from the same duo to make it 66-27 with 8:55 left. Isabella finished with 219 receiving yards on 15 catches. The catch total was the 2nd most against Georgia in school history and the most in Sanford Stadium, his yards was third most against the Bulldogs. UMass finished with 390 yards on 54 plays. *Simmons Says Touchdown: Junior wideout Tyler Simmons enjoyed a big first half with a pair of touchdowns, one coming on a career-long 49-yard rush and the other on an 87-yard reception from Jake Fromm. Simmons finished the half with 49 rushing yards and 81 receiving yards on two catches. He is the first Bulldog to score a TD rushing and receiving since Mecole Hardman against Alabama in the 2018 National Championship Game. *Rushing Attack: Georgia, the SEC’s rushing leader averaging 240.7 yards a game, tallied 426 including 168 in the first quarter. Freshman QB Justin Fields led the team with 100 yards on seven carries including a TD. Junior wideout Tyler Simmons had a 49-yard scamper for the first score and a 7-0 lead with 13:01 mark in the 1stquarter. Earlier this year against Middle Tennessee, he had a career-long 56-yarder for a TD. Sophomore D’Andre Swift (9-for-49 yards) and junior Elijah Holyfield (6-for-50 yards, 1 TD) only played briefly in the first half. *For Starters: Senior C Lamont Gaillard started his team-leading 39th straight game while on defense, the team leader in starts is senior DB Deandre Baker now with 32 including a streak of 14 with junior RS J.R. Reed the most consecutive on defense with 26. Redshirt freshman Eric Stokes made his first career start at LC after freshman Tyson Campbell had started the first 10 games at that spot. At RG, true freshman Trey Hill got his first career start with true freshman Cade Mays out today. Stokes and Hill give the Bulldogs 16 first-time starters this season. Hill is the third different starter at right guard this year due to injuries. *Points off Turnovers: Georgia scored three points off one UMass turnover (interception by Tae Crowder to the UMass 30) while the Minutemen converted one Bulldog miscue (Terry Godwin fumble on a punt return) into seven points, needing to go only 16 yards. For the year, Georgia is now +4 in Turnover Margin, scoring 51 points off 15 turnovers on the year. Opponents have scored 23 points off 11 Bulldog turnovers this year. *Captains: Today’s captains were seniors Terry Godwin and sophomores D’Andre Swift and Monty Rice. *Up Next: Georgia (10-1) closes out the regular season by playing host to Ga. Tech (7-4) at Noon (SEC Network) on Saturday, Nov. 24. Tech beat Virginia 30-27 in overtime in Atlanta Saturday.